April 15,2019 – The Illinois Department of Public Heath is warning of a recall of pre-cut fruit due to reported cases of salmonella. Caito Foods is recalling pre-cut watermelon, honeydew melon, cantaloupe, and pre-cut fruit medley. 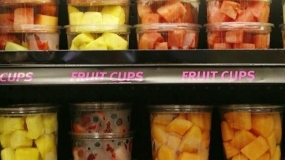 The recalled pre-cut melons were packaged in clear, plastic clamshell containers and distributed to multiple stores, including Kroger and Walmart.